SMRT Feeder Bus Service 307 is a Feeder service operating from Choa Chu Kang Interchange and looping at both Choa Chu Kang Street 62 and Teck Whye Lane, passing through Choa Chu Kang Avenue 5, Yew Tee MRT, Choa Chu Kang Central and Teck Whye Avenue. Bus Service 307 calls at Choa Chu Kang (CCK) MRT twice in a single trip, with different boarding points. 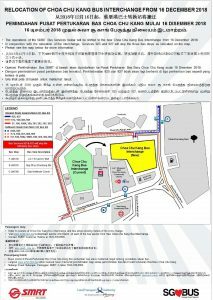 Commuters heading towards Choa Chu Kang Street 62 (Yew Tee estate) should board the bus at either Choa Chu Kang Interchange or the bus stop along CCK Ave 4 (outside Lot 1 Shoppers’ Mall). Commuters heading towards Teck Whye Lane should board the bus along CCK Ave 4 (opposite CCK MRT station). Regular Service 307 buses operates towards the North Loop and continues its journey on the South Loop. Buses displaying Service 307 on the South Loop will continue its journey on the North Loop after Choa Chu Kang Interchange. Service 307A buses will terminate at Opp Choa Chu Kang Stn, Choa Chu Kang Ave 4. Service 307T buses on the South Loop will terminate at Choa Chu Kang Interchange and will not continue its journey on the North Loop. 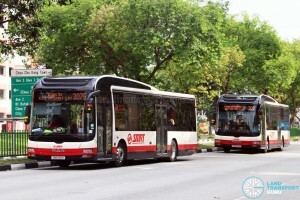 Feeder Service 307 serves residential blocks, schools and public amenities along Choa Chu Kang North 5, Choa Chu Kang North 6, Choa Chu Kang St 62, Choa Chu Kang Ctrl, Teck Whye Ave and Teck Whye Lane, connecting them to Choa Chu Kang Town Centre and Yew Tee MRT. Its primary area of service is Choa Chu Kang Neighbourhoods 6 and 7 on the North Loop, and Neighbourhoods 1 and 2 on the South Loop. Buses stop at Opp Choa Chu Kang Stn along Choa Chu Kang Avenue 4 before continuing on the South Loop, but does not call at Choa Chu Kang Interchange. A full trip of Service 307 will first ply the North Loop followed by the South Loop. Terminating trips will operate as Service 307T (formerly 307E), indicating that the bus will no longer continue its journey on the North Loop after reaching Choa Chu Kang Interchange. From Choa Chu Kang, passengers heading towards Yew Tee (Neighborhoods 6 and 7) should board the bus at Choa Chu Kang Interchange. Passengers heading towards Teck Whye (Neighborhoods 1 and 2) should board the bus at B01 Choa Chu Kang Ave 4 (Opp Choa Chu Kang Stn). On 30th June 2014, a Peak period Short Service (PPSS) variant of this route, 307P, was introduced. It duplicates part of 307′s north loop (towards Yew Tee) and operates during peak hours only. 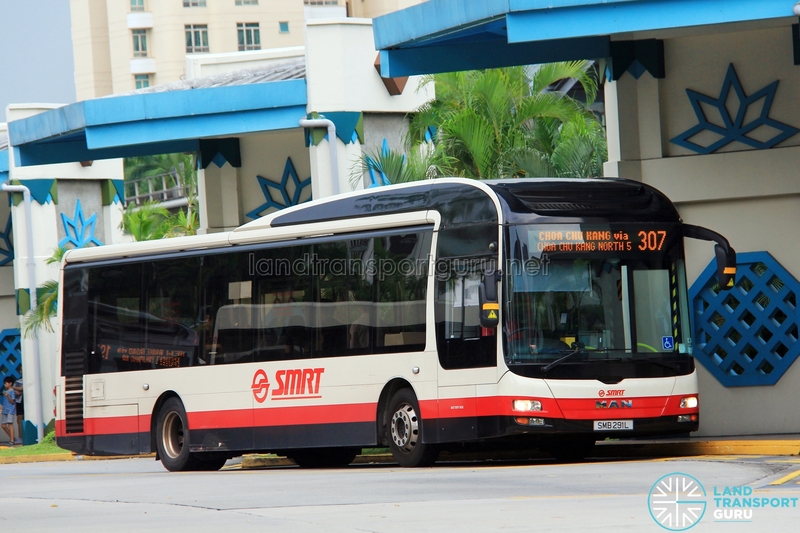 The service was renumbered to 307A and operated by SMRT Buses Ltd from 1 Sep 2016. 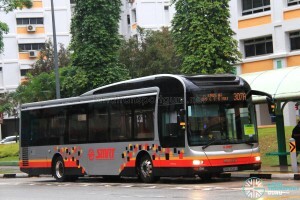 Formerly a Singapore Bus Service (SBS) route since 1997, the route formed with the mergers of existing feeders 301 and 303. 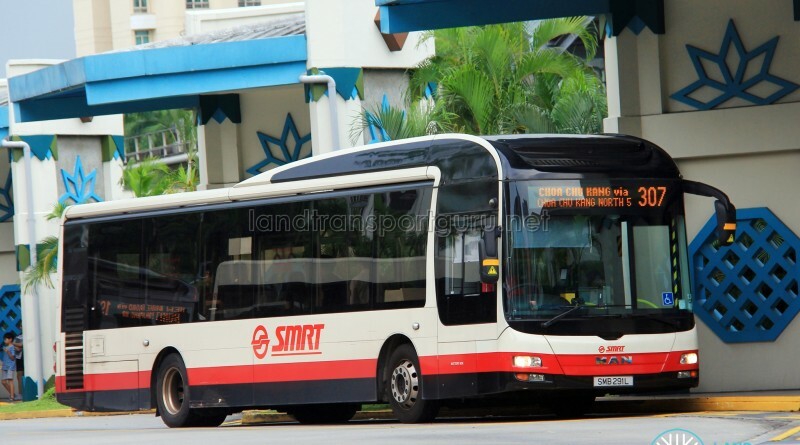 It was transferred to Trans-Island Bus Service (TIBS) in 1999 when areas of responsibility were exchanged between SBS and TIBS, and TIBS has been re-branded to SMRT. High capacity articulated buses are not deployed possibly due to a shortage of buses, and rigid buses are enough to cope on a daily basis. The Intratown branding for Service 307 was dropped in August 2018. Before being renumbered to Service 307T, Service 307 terminating trips (Service 307E) ending at Choa Chu Kang Int/MRT operated in two route variants: (1) Choa Chu Kang Int → Choa Chu Kang Ave 4 (Opp Choa Chu Kang Stn), and (2) Choa Chu Kang Ave 4 (Opp Choa Chu Kang Stn) → Choa Chu Kang Int. 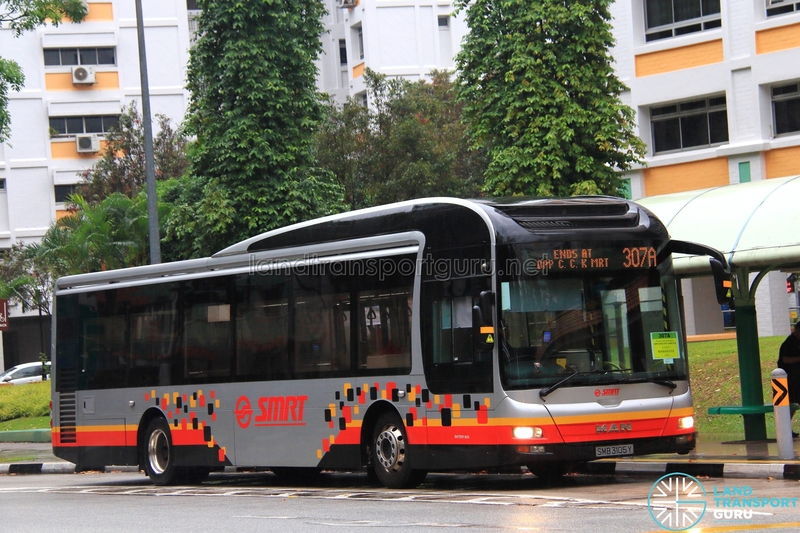 After Service 307A was extended to start from Choa Chu Kang Int on 22 Jul 2018, route (1) was absorbed into Service 307A instead and operates daily. Route (2) remains as the present-day Service 307T and also operates daily. Fare: Fares for Feeder Services are capped at 3.2km. See Bus Fares. 1999 (29 Aug): Handed to Trans-Island Bus Service (TIBS) with no change in routing and known as Intratown 307. 2002 (12 May): Amended to Teck Whye Lane, and at the same time, uses Choa Chu Kang Dr across the KJE instead of Choa Chu Kang Way. Re-routed to start from the Choa Chu Kang St 62 looping point, before proceeding to the Teck Whye Lane looping point via Choa Chu Kang Ave 4. 2012 (21 Oct): Amended to serve Choa Chu Kang Ave 1 (Blk 204) and Teck Whye Ave (Choa Chu Kang Polyclinic), thus skipping Teck Whye Lane (opp Blk 118) bus stop. 2016 (01 Sep): New shortworking trip 307A introduced to replace Peak Period Short Service 307P. 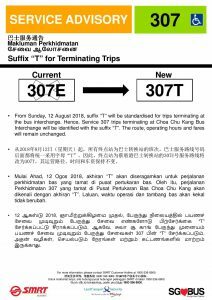 2018 (12 Aug): Terminating Trips renumbered to Service 307T from 307E. 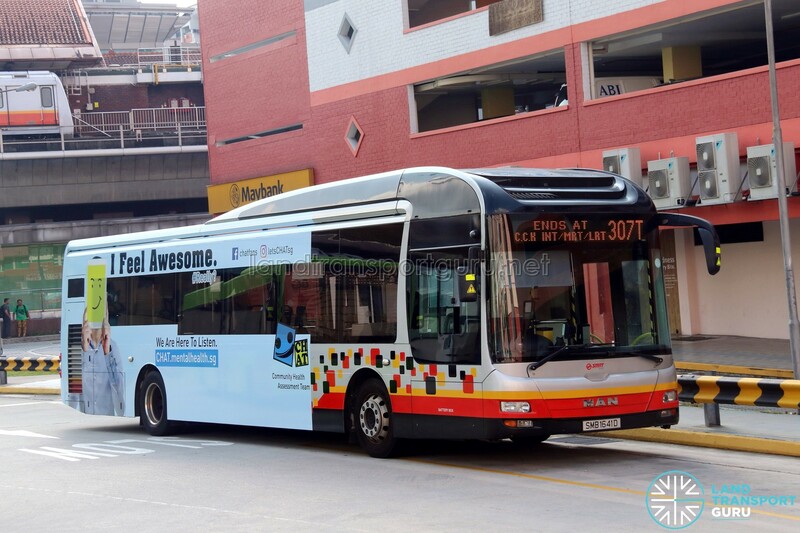 Intratown branding dropped, re-branded as a Feeder Bus Service.